Microsoft has released an excellent tool called Pelnet created by MSFT Michael Hall. This tool can be used for validating the transport changes like changing config of send connectors and everything. This tool can also be used for troubleshooting mail flow issues i.e., connectivity issues with transport servers as well. Basically it’s a Power-Shell script which does this transport validation as well. 1) IT can be used in organization where the Telnet Functionality on member servers is disabled due to security reason. 2) Manual testing of Telnet and NSLOOKUP on each and every transport servers can be eliminated which consumes more time. Refer below Microsoft Team blog for few more examples. Disabled the transport services on Exchange 2013. 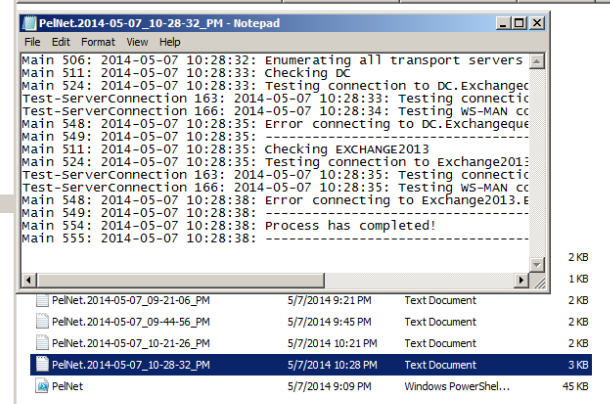 Created a test Send connector in Exchange 2010 . Included only address space Toybox.com on the test send connector. It was able to identify the test send connector with the address space toybox.com. Also it throws an error connecting to Exchange2013 since we have stopped the transport services on the Exchange 2013 servers. Additionally it creates associated txt files in the script location as well. This script can be used for daily monitoring the mail-flow for few parameters to check the source transport server’s functionality. It can be executed on a specified time by using the Windows Task Scheduler.